RKK, Wild Tigers, Mischlings, Tibees. Atyas, Microbrachium, Potimirin. Hi I know this post is old. But where you successful crossing this guys with TB. I few weeks ago I setup a new tank with Fluvan stratum cycle the tank remove nitrate and added 4 male tigers and one female. Slowly acclimatize them to soft water in two days period. And they are doing great I added a female Mischling and she was already with eggs to drop her liter and now I got baby's and the tiger same two so I got tiger and mischlings baby's just waiting for the male tigers to do their thing. This experiment is to try to keep tigers in soft water to mate with my mischlings. After 6 weeks I lost two male tigers. But that ok I got another tank setup with tigers and got plenty and baby suvirval of the tigers in Stratum is great but not for Mischlings half died. The gold is to make my own super tiger. and move them to another tank with Brightwell that I setup 11/13/2018. Later in future the offspring from the tiger and mischlings do I need to cross back with tiger or just inbreed brother with sisters? They are crossbreed for sure, I got mine from Mischling and didn't spec to get RKK Panda from them, because of the report from one of the post from here, But I got mine PRL or Mischlings from Grant and he told me that they are crossbred with PRL and RKK and for sure! I starter to get 50/50 on the first shrimplets no F5 or F7 like mention on the post about Mischlings. I separated the Pandas and got first shrimplets and they are 50/50 not all get to be RKK Pandas. I guess you need to clean the line. inbreeding. HI nice shrimp share some pictures, How are you raising the PH for the tank matter or just water chemistry. And why you want to turn them to hard water you wanna breed them with other tigers? I know this is been years now, But what happen? Lol besides the other options for substrates Controsoil and Brightwell. Did your test with the ADA and Fluval had any beneficial output did the Fluval Stratum give you a solid PH reading how long did it last and how low did you get the PH with both substrates. I am using Fluval so I interested on the output of this test. All the world is against this substrate and is making me think I should change it. Thank in advance if you have any information save from this test. Awesome shrimp's beautiful Blue's, The female you use for this cross is a Tibee from a Snow White with Aura Blue is that correct? It does not look like a normal Aura Blue is been cross once right? they don't have a line on the back normally. interesting cross love the blue's. In Caridina who carries the Genotype the Male or the Female? Base on selected breeding you will select the best male and breed him to multiple females. Culling base on Phenotype looking for color etc etc, or what you want, you select the best male and females and remove the rest. Who has the strongest genetics to carries the Genotype that will produce the linage you are trying to follow the male or the female? Thank you in advance. Yes really good algae cleaners, they eat all types of algae's, the variety is unknown the only records of this shrimp is from Brazil but they are different they are Potimirin, Potimirin, Glabra is from the family of the Atya different specie. And still this one I got is totally different from the one on this site below. they have reported two varieties Potimirin, Potimirin and Potimirin Brasiliana. http://www.planetainvertebrados.com.br/index.asp?pagina=especies_ver&amp;id_categoria=24&amp;id_subcategoria=19&amp;com=1&amp;id=162&amp;local=2 They are longevity shrimp I have several Potimirin that they are 8 years old. and still alive and reproducing larva. I seen this shrimp for sale as Amano in the states they are available on the rivers that meet the coast in Florida. What Salinity do you use to start the Larva do you start at 1.025 SG and then lower to SG 1.020 and start lowering the salinity as they mature? I have to do this for this specie 3 level salinity's. I see you are trying right know with SG 1.017. Another question what do you feed them, besides the algae built up on the glass from the light. I only get 25 % survival rate. I started a batch of around 200 larva's and will end with only 30 or less top survival. Need to get the salinity's levels right need to perfection the technique still working on this I see you have thousands now wow. I have try adding the larva at SG 1.025 for the entire cycle and fail and add to adjust the salinity to three level in a period of 10 to 15 days laps to get more survival. Any tips will be appreciated. Hi I got a shrimp specie that only reproduces on brackish water like the Amano and been breeding them using the same Technic. They are call Potimirin. 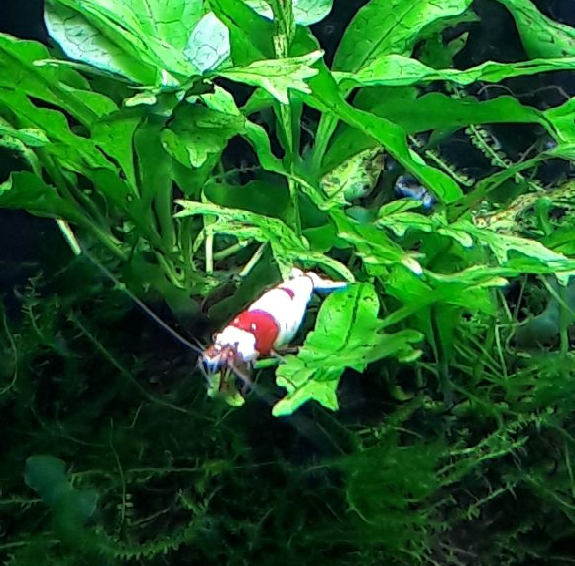 looks like Amano but they are from Costa Rica and have red color and blue with red spots. But most of them looks like the one on the picture below. Like your project great work I have not been able to succeed without people like you experimenting years back and sharing knowledge about the process. Thank you. I have been asking this same question around for months now. And all I can find is that most of the people breading shrimp are just mixing multiple colonies together or adding females to other colonies. Or selected breading a female to a male. And there is not control of the gene pool I guess because of the origin of the same cannot tell what is recessive or what is X and what is Y so the only thing to work with is the phenotype. And work from there. Not a doubt, Grant has really cool shrimps. But keep us updated with your project. Any updates on the Stardust pictures. Following thinking of getting some. Hi, New to the group I just read all the post, Awesome shrimps, Question did you get better results from the Female Tibee or the female TB x Male Tibee. For the Zebra pattern. Post pictures of the F6 or which generation you have by now. Nice project.